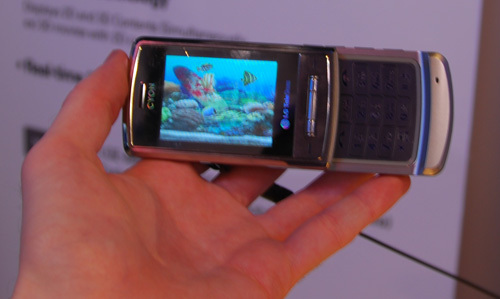 [CES 2008] LG Emotion 3D Mobile Broadcasting | OhGizmo! By Evan Ackerman on 01/08/08 • Leave a comment! When LG talks about 3D in relation to cell phones, they’re not talking about a third visual dimension (like, depth). Instead, they’ve gotten the phone to sync its vibrate feature and LED lights along with audio and video streams. It sounds gimmicky (and yes, it sort of is), but it’s also surprisingly effective: if you’re watching football and someone gets tackled, the phone vibrates sharply. Or if you’re watching NASCAR, the phone vibrates in sync with the passing cars. It makes the experience of watching content on that tiny screen much more interactive, and it works for movies, too. For the record: I don’t watch football or NASCAR.